At the top of the hill, the air was cold and clouds drifted across a strange moonless night. "My fur feels weird," said Skratch as he clung to the rough, sloping roof. "Mine too," said the Wabbit. "Where's Ghost Bunny?" asked Skratch. "On her way," said the Wabbit. "Shall we wait then?" said Skratch. "No," said the Wabbit. "Lets just go in." "Shall we knock?" asked Skratch. "We shall sweep in as if we owned the place," said the Wabbit. "You look a bit a devil, Skratch, so now you're the devil and you've come for your stuff." "What stuff?" said Skratch. "Your gambling winnings from card games," said the Wabbit, "Talk tough and show no mercy." "What about you?" said Skratch. "I will be your hopeless assistant." said the Wabbit. "Make fun of me and I will distract them." "I'm going to enjoy this," said Skratch. 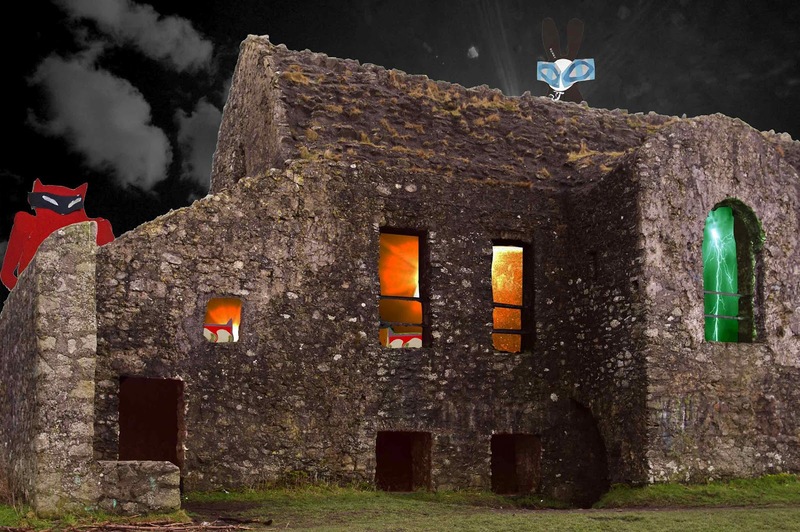 "Don't get used to it," said the Wabbit and he shivered as a drawn out groan issued from the depths of the building and echoed painfully around the roof. Gales of laughter pealed from the house and and flame spat from the window, blackening the stonework. "Let's go, my genial fool," said Skratch with a grim smile. "The devil always gets the best lines," said the Wabbit ruefully. Silently they dropped from the roof and swept through the dark entrance.